The SDR-4000 Dual Digital USB / SD Audio Recorder & Player from VocoPro is a standalone unit that offers real-time, high-quality digital audio recording and dual-side playback. The recorder enables high-fidelity recording onto both SD / SDHC cards and USB drives with capacities of up to 32GB. Additionally, it sports an easy-adjust recording level control that helps to monitor audio levels and eliminate distortions. The unit can also turn into a dual-side audio player with both single and repeat playback modes for easy digital playback. The rear panel features individual and mixed RCA and individual XLR inputs and outputs. It also comes with a 1/4" headphone jack with volume control for convenient monitoring. The SDR-4000 Recorder and Player features a slim 1 RU design that allows it to fit into any standard equipment rack for easy installation. The user-friendly operation is similar to that of 2 cassette decks. This makes it suitable not only for performers, but also places of worship, businesses, schools, etc. for recording and playback applications such as band rehearsals, sermons, presentations, lessons, and more. The recorder does not support USB 2.0. Box Dimensions (LxWxH) 20.2 x 13.7 x 3.8"
SDR-4000 Dual Digital USB / SD Audio Recorder & Player is rated 4.6 out of 5 by 8. Rated 5 out of 5 by Texsrob from Just what we needed We bought the Voco Pro SDR-4000 Audio recorder to record sermons, it operates similar to the dual cassette tape recorders except it records with better quality. Since it records in MP3 format it is easy to burn to CD. It can use USB memory sticks or SD memory cards so it is convenient to use. Rated 4 out of 5 by JohnMac from Recording on-air for a LP FM radio station Too new to really judge for robustness, but it's a nice design. It was easy to install, either with RCA pins or XLR cables. The single device incorporates two separate recording units, and they can be used separately, or one can be recorded from the other. Our radio station's operating board has two major outputs: 1- on air and 2- audition. They are completely separate. One engineer can monitor the on-air content while recording an interview for later airing, for example. Easy to use. And the outputs can be managed separately or mixed together. It records on a USB drive or SD card in an MP3 format, and a 16G USB thumb drive can hold hours and hours of content. Rated 4 out of 5 by Planner from Easy to use - Sounds good I am a meeting planner and have volunteers recording the sound at our meetings - This unit was easy to use on the first try, the sound quality is good and the price was right. Rated 5 out of 5 by Grobert from I would buy it again. The recorder is used to record the church service. I edit it and send it out in CD form to shut-ins. Many of these people are not computer savvy so a CD filled the bill. I have been frustrated with recorders for 8 months. Having tried several different options, I selected this one. It is perfect for my purposes and it is very simple to use. The few occasions that I am away, someone else can use it with a minimum of instruction. Rated 4 out of 5 by Canberra Steve from Simple and Effective Use this to record lectures in a simple portable rack set up. It's simple to use and has worked well so far. There are some limitations with the interface but overall for the price this is a great and reliable unit. Rated 5 out of 5 by Anonymous from Versatile, Simple to use, and great price This recorder is easy enough for anyone in the congregation to use. It's simple to set up and simple to use - and still gives great results. The only downside is that nothing in the documentation will tell you that the record media needs to be formatted as FAT32 or it won't work. I figured it out myself after not getting any response from their tech support people (2 days I've waited so far). Will this record a pre-digitized signal from a USB audio device? I have a mic/preamp/ADC that provides standard USB connection. Currently, I'm storing the resulting audio stream on my laptop, but the fan-noise of the laptop is audible in the recordings, and I'd like to find a fanless device to replace the laptop in this function. does this recorder have a built in hard drive for storage or strictly record to media? Hello there, i'm looking to replace a 15 year old cd recorder &amp; this USB recorder looks interesting, but i'm a skeptical, because i never heard of this brand before. How's the build quality of this unit? Does the recording quality of this unit sound as good as CD? Thanks! Vocopro caters to Karaoke and DJ customers. 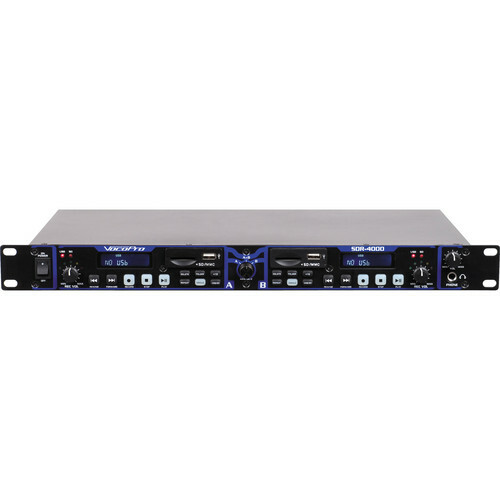 The SDR-4000 is a dual recorder and player with independent inputs and output connections for each deck as well as a mix output via RCA. The unit records in Mp3 format which is compressed and not CD quality. Is there way to record to a computer with this? Or connect to a computer so that the computer can access the recorded files? Unfortunately it will not. VocoPro is a standalone unit that offers real-time, high-quality digital audio recording and dual-side playback. The note is current as you will find the same stated on our website on the product page. The recorder does not support USB 2.0. G'day, I plan to use this to record sermons in a church, what microphone should I use and does it need to be phantom powered? At the moment I am using a Audio Technica AT 857Ma mic with the power module AT8531.When I plug the mic cable into the SDR-4000 the recording is very faint, should the mic be going into something else first? Hello, B&amp;H asked me to respond; I am just another customer. If you have a ribbon mic or a low level mic or a low impedance mic (150-300 ohms) you need about 80-85 dB of gain to bring the mic up to be seen as a high level or dynamic type. All modern electronics unless specialized expects to see line level for audio and High Level for microphones. IF you are getting a faint recording, your best first bet is to put the Cloud in-line booster which will bring it up to around 45 dB. Cloud also makes the same booster with an impedance matching network (a better buy for your money). It requires Phantom Power. If you need additional gain after that, the most bang for the buck is the PRE-73 Mark III. Around $400-450. Try the Cloud first. Hope this helps. does this work for recording audio from a headset mic? My headset mikes go to a receiver, then to a mixer console and then to the recorder. My wireless receivers have a volume control, RCA output and a balanced XLR output. The recorder has RCA and XLR inputs. My guess is that a direct hook up to the recorder would work. will this play off of one side and record to the other... play an accomp track and play with the accomp via a mixer and record the result?